I’m happy to announce our next support group meeting in 2018….. The support group is free and we’d love to have you attend with your family and friends. 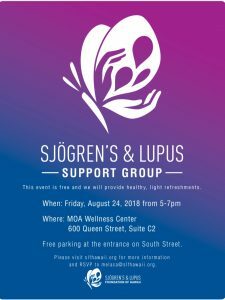 You will also have the opportunity to meet others who are living with Sjögren’s syndrome, Lupus and other autoimmune diseases. We will also be providing FREE healthy snacks too! Please come and share, learn and get the support you need to live healthy and be happy everyday! For questions and RSVP please contact [email protected].